Vagabonds and Jayhawks: Gary Louris at High Noon Saloon | True Endeavors Presents: music, tours, tickets, mp3 downloads, concert pictures, videos, Madison WI. It would be hard to follow an opener as fantastic as Ben Kyle, but Gary Louris took the stage and delivered. His set list was a sprawling portrayal of how far his music stretches: from the Jayhawks to Vagabonds (his most recent release) and other new songs as strong as any he has written. He knows what songs people like to hear and, more importantly, he has fun playing them. Rainy Day Music (Jayhawks, 2003) was front and center last night with tunes like “Angelyne,” “Tailspin,” “All the Right Reasons,” “Save it for a Rainy Day,” and “Eyes of Sarah Jane.” And even though he thought the crowd was craving an electric guitar and a band behind him, the sound was just right with Louris: his acoustic guitar and a harmonica. Performing as a one-man-band this Friday in May, Louris did an excellent job carrying the Jayhawk’s torch. Though not necessarily in the starring role, Vagabonds still had its place in last night’s show. “D.C. Blues” showed up early and “True Blue” helped wind the show down towards the end. 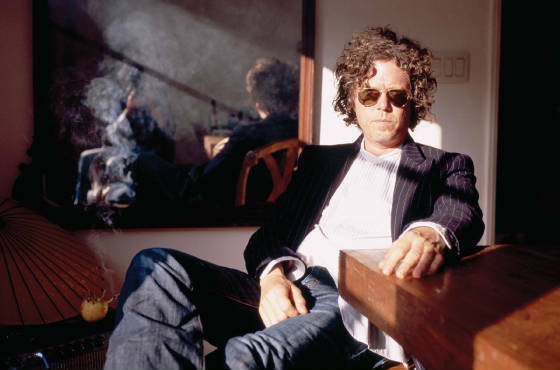 As the show went on, the mention of people Louris has collaborated with over the years went on too, including names like Wilco’s Jeff Tweedy, The Dixie Chicks and Soul Asylum’s Dave Pirner, to name a few. And it’s clear—after hearing songs from Golden Smog and other side projects—that Louris is the Francis Coppola, the Babe Ruth, of songwriting. It seems as though everybody wants a piece of him, and after hearing tonight’s set list, it’s no wonder why. The man is a song factory, a lyric machine. If you didn’t make it to the High Noon for Gary this time, make sure you catch him next time—which should be soon considering his upcoming shows with the ’94-’95 rendition of the Jayhawks and another album with fellow Jayhawk Mark Olson. After hearing unreleased songs like “Big City Snow” sneak into the set list, it’s clear we have a lot more Louris classics yet to come. Kyle is not the frontman for the Romantics. His band is called Romantica. Good eye, Dan! Thanks for the correction. It’s now fixed.